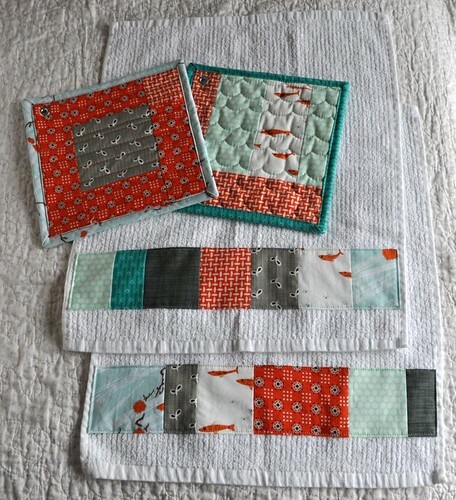 I made just a couple gifts for Christmas this year; first is a set of potholders and dishtowels for my sister-in-law Amy C.
I was excited to use my Go! baby cutter to make this set after it had been stored away for a while. I think the tumblers are so cute and would like to make a bigger project with them sometime. For the dishtowels, I just used bar mop towels that I had on hand. I want to buy more flour sack dishtowels to pretty up, but I don't know if people (who I might give gifts to) would like them as much as I do. 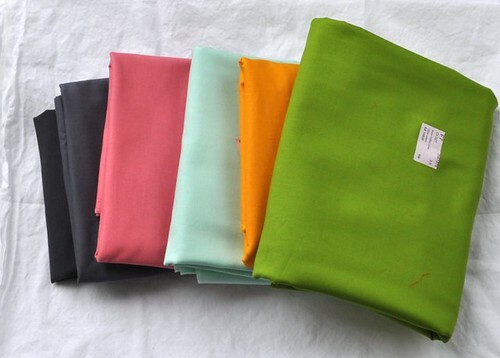 I wasn't planning on including the aqua fabrics at first but they just sort of needed to be included. I like this color combination a lot. I put grommets in this set of potholders and had help from kids who were excited to help hammer. I am running low on the Katie Jump Rope red-orange fabrics and need to find a replacement! And I got to open up this beauty on Christmas morning! 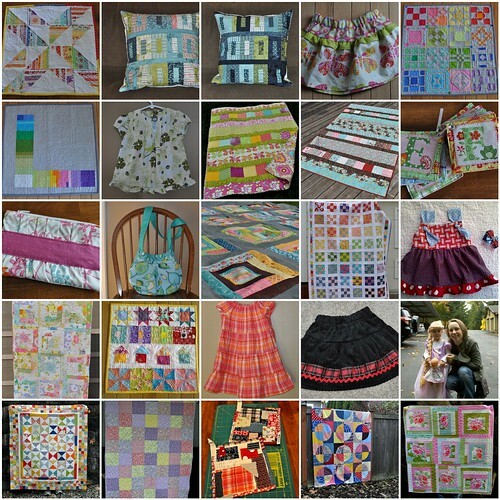 My mom made quilts for her grandkids the last two years (there are 15 with one more on the way!) and this year she made a quilt for each of us 6 kids. I asked for a fall quilt and I'm really happy with this one. 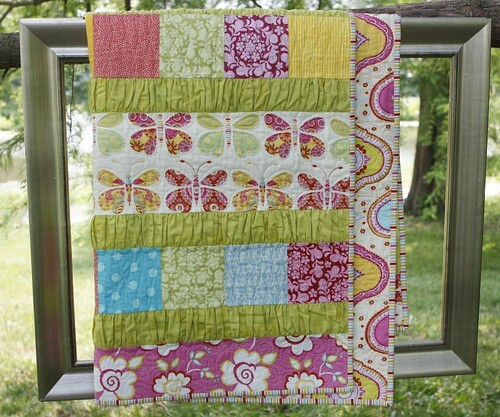 :) I have a jelly roll of this same fabric line, I might make some pillows to go with it. p.s. I'm working on getting things ready for Focus on Free Motion Quilting, please come by next Tuesday (1/3) for the launch! 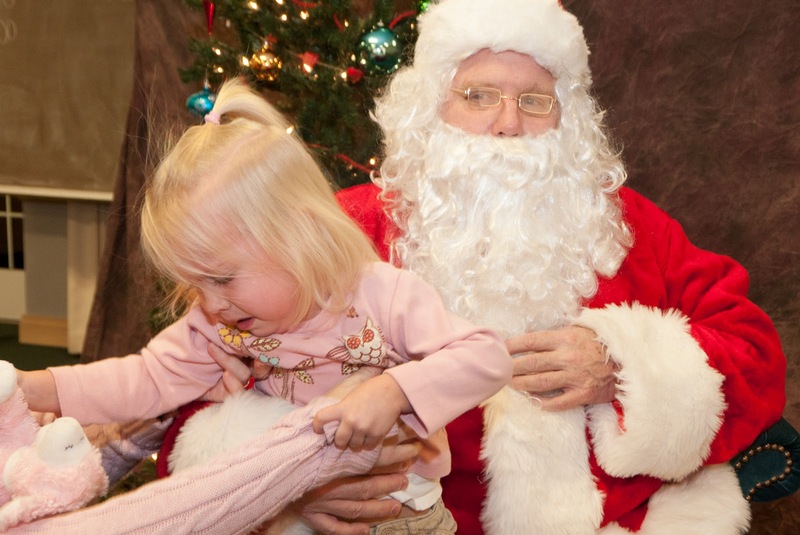 Not a fan of the big guy. The kids at the beach on Christmas Eve. Seattle was so nice yesterday. Dark pic of our tree last night. The quilt blocks I've been making the last couple weeks. These scrap blocks are 6 1/2" and I think I'll make a big quilt with about 80 of them. Tiny 9-patch for no reason, I just wanted to make it. I started this quilt in Kansas, with hopes that it would be finished and sent off quickly. Then we found out we were moving. I finished the quilt top while we were living in our temporary apartment, and then quilted it right after we moved into our house in November. I used loops, S-curves, and loopy zigzags, and just tried to make sure that adjacent strips were quilted with different designs. 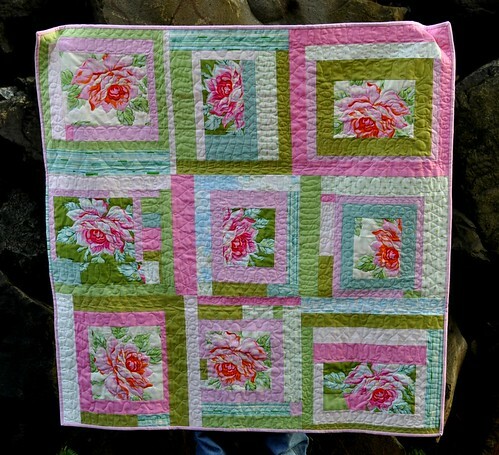 The roses in the centers of each block were quilted on the outlines of the roses and leaves. 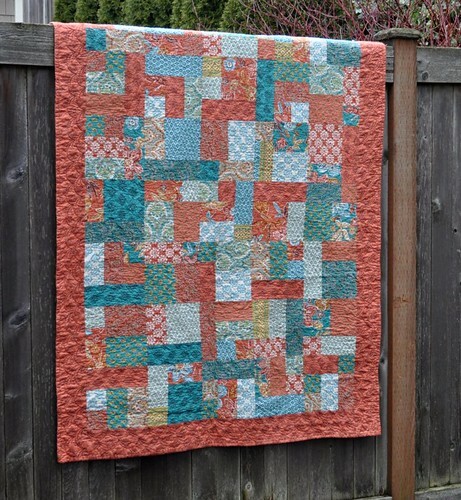 This was kind of similar to the quilting I did in my vintage sheet quilt, but in that quilt I did a different design in each strip of each block (designs were repeated in multiple blocks, though). Using only three designs made the quilt look more unified, I think, and there was less thinking/decision making along the way, too. 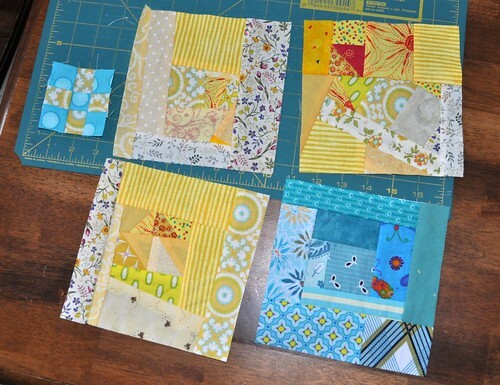 Don't forget about Focus on Free Motion Quilting next month; we'll have how-to's and encouragement, along with a free motion quilting link up at the end of the month. Beginners and quilters with all levels of experience are welcome! 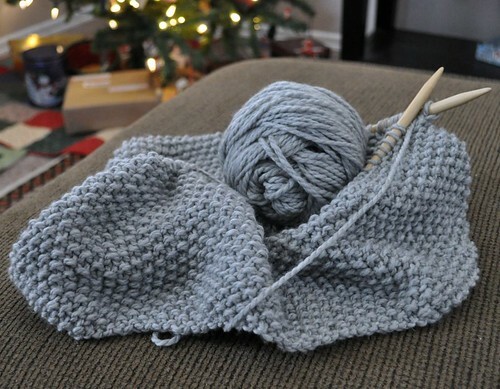 "I crocheted a baby afghan for my newborn nephew in 2 days this past summer. I took yarn and a hook with me on a camping trip. Between 8+ hours in the car and time around a campfire and porch, I finished it. I could then enjoy the rest of the week camping without that deadline hanging over my head :)"
That's amazing to me, I have always been quite slow when I crochet. 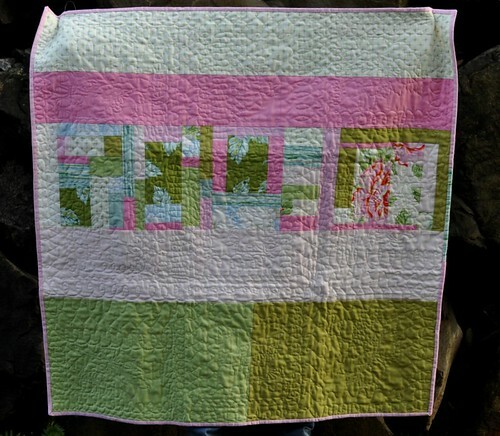 I've emailed Nancy Sue and will be sending her the mini-quilt in a few days. 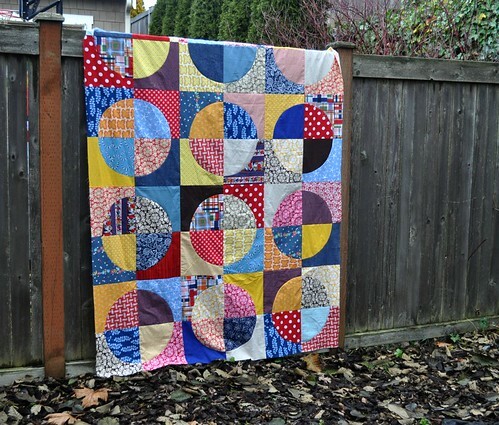 This is our back fence; the quilt has one more row of quarter-circles (half circles, I guess) hanging over the top of the fence. The quilt measures 60" x 80". This was fun to put together and it didn't take me too long. It will be a little while before I'm ready to quilt it but I have something fun in mind for the quilting. My boys are out of school for winter break now, so we'll be trying to do some fun activities over the next couple weeks, and I'm going to work on fitting some sewing in as well. 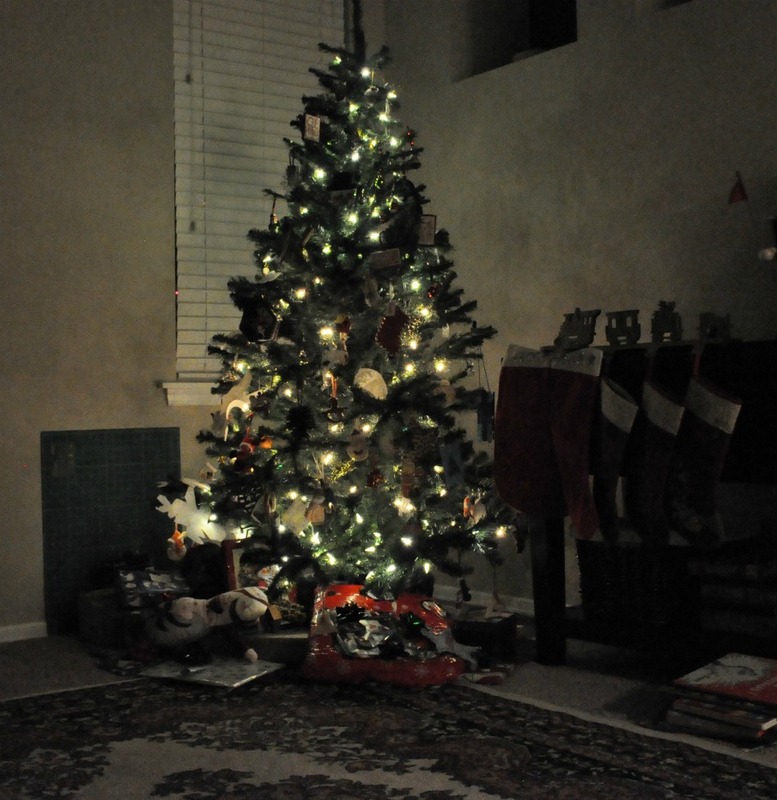 I hope you're having a good holiday season! Hello friends! 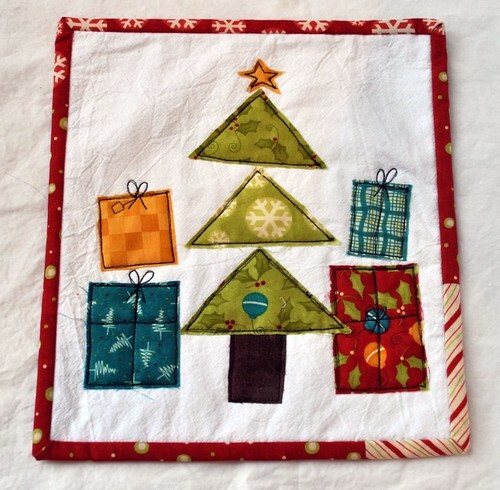 Today is the beginning of Giveaway Week at Sew, Mama, Sew, and I have a little Christmas mini quilt for one lucky commenter. It's about 10" x 11" and the appliqued tree and presents and the binding are from Moda's Merry and Bright line from a few years ago. 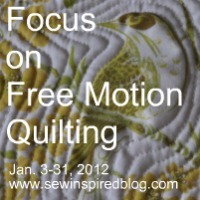 And quickly, before you leave to go enter more giveaways, I wanted to let you know I will be hosting Focus on Free Motion Quilting next month! 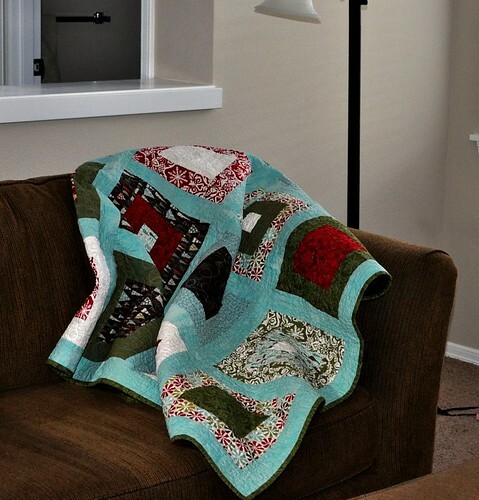 We will talk about getting started with free motion quilting (non-beginner quilters are welcome too! ), and I have some great guest bloggers lined up to talk about their experiences with it as well. 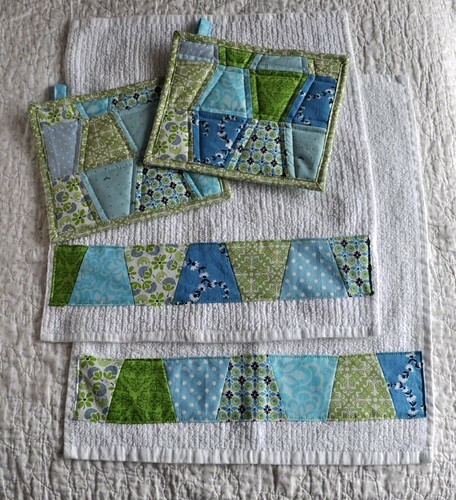 At the end of the month we'll have a link-up for participants to share projects with their new free motion quilting skills and there will be a few prizes as well. There's a button in the sidebar if you want to spread the word--and please check back on January 3 if you're interested in participating! Don't forget to head over to Sew, Mama, Sew for tons of other giveaways! This pile is for making the back for this quilt. 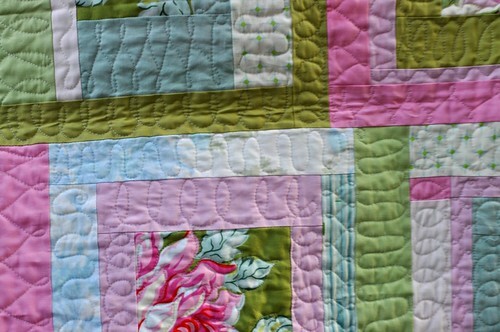 These colors match the flea market fancy fabric (and others) in the quilt top really nicely. From left to right, they are Kona charcoal, coal, melon, ice frappe, and lime. The binding's going to be lime, too. I'm still not sure how I will quilt it, but I'm excited to get going again on this quilt. I've also been working on my knitting; I try to do a little bit every day so my cowl will be done soon. My purling has improved a ton since I've been working on this project. Here's the link to the pattern if you want to know more. I cast on 10 fewer stitches than the pattern called for, to make it a little shorter. I got the blocks put together for the first two rows of my circle quilt. So far, I'm liking it! The first blocks on the left of each row have a little paper pinned on with the row number, to help me keep everything straight while I'm sewing. I haven't pressed any seams yet; I'm waiting until all the blocks are done and I can make sure I like the layout. Then I'll press the seams alternating "in" and "out" so the top will go together smoothly. I have a couple of small projects I want to make for Christmas gifts and I think I'm going to work on one of those this afternoon. I might sew 6 more circle blocks together first though. Also--I wanted to tell you about something I'm working on for January. I'm going to host a free motion quilting challenge. 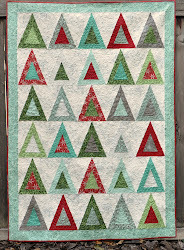 My hope is that people who haven't tried free motion quilting will give it a try, and that those with a little (or a lot of) experience will maybe try something new with their free motion quilting. I'm planning on having a link-up at the end of the month for people to share projects with their new skills. Oh yeah, there will be prizes, too! I'm still working on the details, but for now if you have any questions or problems related to free motion quilting, let me know in the comments and I'll work on including answers next month, ok? I pulled out my favorite Christmas quilt the other day and have been enjoying snuggling up with it. I love the colors; the figgy pudding fabric by Basic Grey is just perfect. I would love it if they reprinted this line, I'd totally buy more. The red and white would make a gorgeous little girl's skirt. 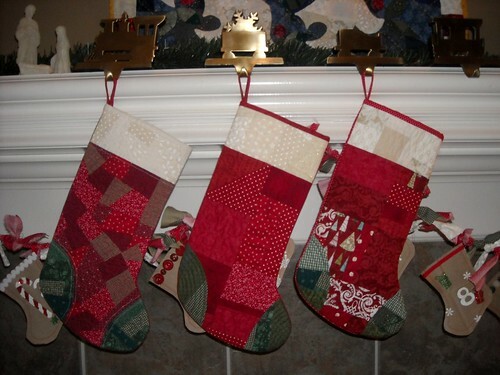 I wanted to remind you of my scrappy stocking tutorial; it was posted last year over on the Sew We Quilt blog. These aren't difficult to make and I think they turn out pretty cute. 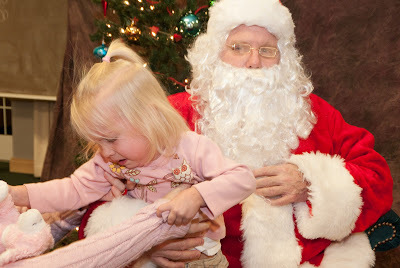 I'd love to see a picture if you make one, ok? Also, are you on Pinterest? I am trying to find (and pin) the cutest handmade ornament ideas and then I think I'll pick one or two to make a few of this year. You can follow my boards here if you want. I've also been knitting and working on my circle quilt; more on that soon!